I love this time of year. There’s something kind of magical about it. The autumnal crackly edge in the morning air, the golden mellow afternoon light, the glorious colours of fallen leaves and the threat of looming cool nights as evenings gradually begin to darken. It’s brisk. A little temperamental, slightly wild. But it’s also fleeting, peppered equally by a little hint of summer and the best bits of winter. It’s this time of year, I long to spend a few more previous hours in the kitchen, preferably baking, working with spice and strong, rich flavours. I have noticed that the most cheerful of smiles appear on faces when a home-baked dessert is served, which is why I choose to bake so often – for myself, for those I love and for their loved ones too. After a long autumnal afternoon walk, a cup of tea accompanied by a plate of freshly baked vanilla and earl grey butter cookies and a few hours to spare - I made these cupcakes. They are a perfect afternoon autumn indulgence though I imagine they would work equally as well for my friends in the states, who are experiencing a warmer transition into spring time. Every now and then, there are times when modesty doesn’t really help anybody. And it’s times like these when I create something delicious that I really want to scream all about, share with you dear readers… and also give myself a good pat on the back. These cupcakes are case in point. They are ridiculously amazing and the only way you’ll ever know is if I tell you, or you make them yourself. Blondie cupcakes with miso buttercream are a dream. 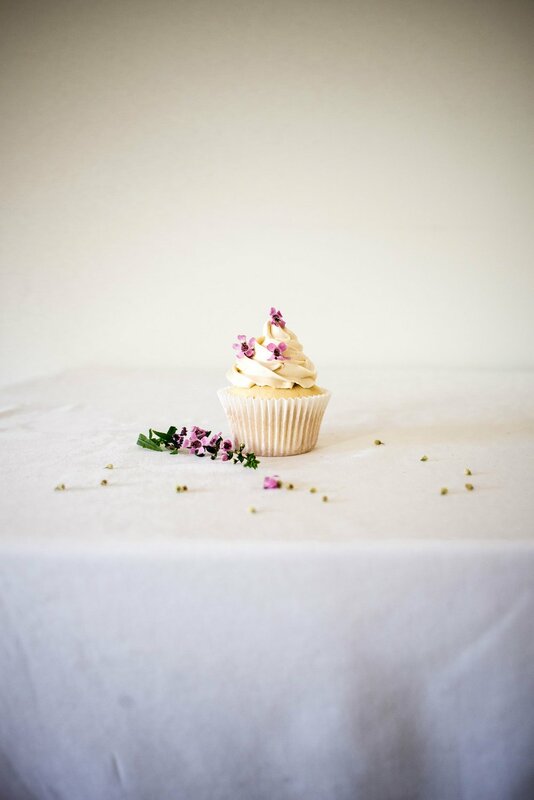 The blondie cupcake base is reliable, light and delicate with a moist and tender crumb. Made with the addition of white chocolate chunks and pure vanilla bean extract, the sweetness of the cupcakes does permeate throughout. Though, this sweet flavour is counter balanced by a salty miso flavoured Italian meringue buttercream. I admit that at first miso in a buttercream does sound a little bit bizarre, but I promise you it is seriously delicious. If you, like me, enjoy really pronounced flavours like salt, matcha or smoke in desserts, it makes perfect sense. The ‘salty-umami zip’ of white miso paste is a great partner to compete against the sweet buttercream and blondie cake. As a lover of odd flavour combinations, these cupcakes managed the fusion of sweet cake and salty miso with ease. As with most sweets I bake in my kitchen, I feel they should be shared with those who may find a little bit of happiness from a big bite. These cupcakes went too quickly and have already been requested to be made again. I feel certain you too would fall in love with them just as easily. You don’t need an occasion to make them. They are the perfect sweet thing to make any ordinary day feel just that little bit brighter. Pre-heat an oven to 175 C / 350. Line a 12-hole cupcake pan with paper liners. In a medium bowl, sift together the flour, baking powder and salt, set aside. In the bowl of a stand mixer fitted with a beater attachment, or with electric hand held beaters, beat the butter and sugar until light and fluffy, roughly 5 to 7 minutes. Add the eggs, one at a time, beating well to incorporate after each addition. Add the vanilla extract followed by the dry ingredients, alternating with the milk. Add the white chocolate chunks and beat until combined. Divide the batter evenly between the prepared liners and bake for 17 to 20 minutes or until a skewer inserted into the middle of the cupcakes comes out clean. Let the cupcakes cool in their pan for 5 minutes, before removing them to cool on a wire rack completely. Once cooled pipe on the miso meringue buttercream. In a small bowl, whisk the miso and water until very smooth. Press the mixture through a fine-mesh sieve to ensure that no chunks remain. Set aside and let the paste cool to room temperature. Put the egg whites and 2 tbsp. of the caster sugar into the bowl of a stand mixer fitted with the whisk attachment and turn it to a low speed. Put the remaining sugar and water into a medium saucepan. Stir it over low to medium heat to dissolve the sugar. When the sugar has melted and begins to bubble, brush down the sides of the pan with a pastry brush to ensure all crystals are dissolved. When the sugar reaches a steady, rolling boil, increase the mixer speed with the egg whites to medium. Continue cooking until the sugar reaches soft-ball stage, 250 F / 121 C on a candy thermometer. Increase the mixer speed to medium-high. The egg whites should be fluffy and shiny but still soft. Carefully pour the hot sugar syrup in a slow, steady stream into the mixer. Increase the speed to high and whip the meringue for 6 to 8 minutes, or until cool to the touch. Add the butter, a little at a time, whipping until completely combined before adding more. If you see the butter melting, stop adding butter and whip the meringue longer to cool. When all of the butter has been added, add in the miso paste and continue to mix until the buttercream is very smooth, fluffy and thick. The buttercream is now pipe-able and ready to use – the buttercream can also chill in the refrigerator to slightly set the solids more if needed whilst the cupcakes continue to cool.